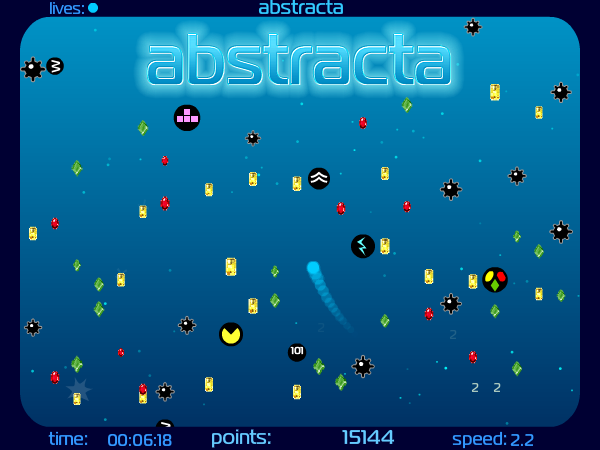 Abstracta was an attempt at making a relaxing flash game with a zen-like atmosphere and a natural flow, which would evolve, step by step, into a more complex type of game as it was played. The basic gameplay is the same all through the game, except for four spectacular boss battles, but because new powerups are introduced along the way, which alter the game world in each their own way, and because many of these effects can be combined, Abstracta actually has a rather high complexity for a flash game. It is also full of funny references to arcade game classics, such as tetris, pacman, 1942 and snake. My role in the production: Everything, except music.